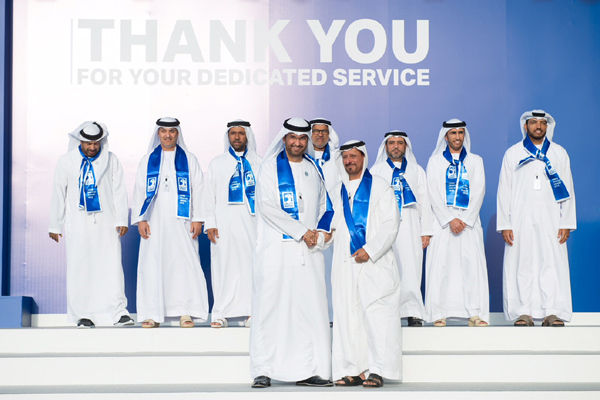 The Abu Dhabi National Oil Company (Adnoc) recently honoured and celebrated its employees who have worked with the company between 10 and 40 years, said a report. More than 500 employees gathered in front of Adnoc’s headquarters to participate in a ceremony that focused on their years of dedicated service, reported state news agency Wam. The company commemorated their work anniversaries by arranging for them to have group photos taken with Dr Sultan bin Ahmad Sultan Al Jaber, Minister of State and Adnoc Group CEO, as well as other members of the company’s senior leadership team. Speaking to the award recipients and their colleagues, Dr Al Jaber emphasised the company’s respect and appreciation for its people and the achievements they have helped Adnoc reach. Dr Al Jaber noted that employees who choose to make a long-term career with Adnoc are the ones who allow the company to do things differently and continue to thrive and make a positive and long-lasting impact on the UAE.